Guinea Pig Tricks? You bet! Teaching your Guinea Pig to do little tricks is fun and really pretty easy to do. Guinea Pigs do not train like a dog would but with patients and fair training it pays off. It may take longer to train your Guinea Pig to jump through a hoop then it would to train a dog the same trick, but have fun, take your time and bring treats. Be fair and just to your animals while training and have fun. Teach your Guinea Pig one trick at a time. After the Guinea Pig understands the first trick you can then begin to train a different trick. Repetition is the key. Try to show the Guinea Pig the same way each time. Try to hold you hands and your face the same each time you teach the same trick. You may have to show your pet 3 times or 10 times or 20 times, but when the light bulb goes off in that little head, it will remember the task and repeat it each time you ask. Don't loose your patience, just relax and enjoy the fun time spent with your pet. If your GP is not catching on right away to the trick you are teaching it, this does not mean your Guinea Pig is stupid. It can mean many things. Usually, it is either that the Guinea Pig is scared, or not secure, or it could be your training technics. If your GP will not take food from your hand, put it back in it's cage and start there. Hold the food, like a short carrot stick, over the food bowl and wait for the GP to come and get the treat. Don't follow the GP around the cage with the food. Wait for it to come to you. Build a relationship with your animals before starting to train them. Clicker training is not new or the wondertool. Use your voice. Animals should learn that Your Voice = Good Things. Your encouraging voice teaches your animal to want to be with you, around you, please you. Clickers in your hand can get in the way when training animals. Many times you need both hands to correct or show the animal just want you are looking for in a task. Your voice is unique. Your voice can be varied, and used to bring the behavior, like with a long drawn out "gooooooood". Or a short straight to the point "good". Before training your Guinea Pig tricks like using a ball or pushing things down, watch your GP in it's cage. Does it use it's teeth to move items and food bowls around in it's cage, or dose it use it's feet? If your GP uses it's feet it might not be a good idea to use items it could get it's feet caught in, such as a wire kitty ball that looks like a little round cage. If your GP uses it's teeth a to pick things up and nose to move items, make sure the items you use for your trick props have little holes in them. These little holes, or slits give the GP something to grip unlike smooth balls it could not pick up. If your GP comes to the cage door when you come to feed, start calling it's or their name(s) each time you feed. Teach within the behaviors that your GP is already showing. Once you have taught it things that are easy for it to do, it has learned to learn and will learn tricks that will be harder for it to do easier. There are some tasks that are good to teach pets. Words that could save their lives or at least make yours easier. Words like "Back Up", "No", "Wait", (and more)please look below on how to train these behaviors. When training your animal keep in mind that each trainer and each animal are individuals. I have here some ideas of how to train your animals. This is what has worked for us. We are not professional trainers and are not there with your seeing just what you are doing with your animals as you train. We will not be held responsible for you training your animals. This is easy to teach. You can teach your GP to come to you when called. Do this the same way you would teach a dog or cat. Say their name when you feed them, when you pick them up out of their cages, when you move them from person to person, ext. You will be very surprised how fast your GP will learn it's name. Just remember, to them "Name = Fun or Pleasure or Treat". TEACHING YOUR GUINEA PIG TO "TALK TO ME"
Be very sure you want to train this trick. 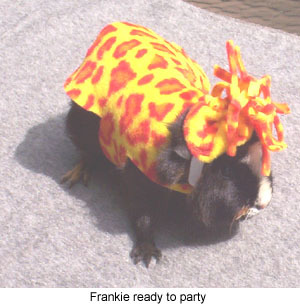 Guinea Pigs are vocal, if you encourage this it may become the "go to trick" (see below). You may be creating a loud pet, one that will get louder and louder if not given a treat for what is now something you have asked for. First you need a hoop that is the correct size. You will need a hoop about 6" -10" in diameter. Remember the old Jarts game? Now one of those hoops would be perfect, if too large you can take them apart and trim them down. Use a hoop according to the size of your pet. Other ideas would be an embroidery hoop, the outer rim of an ice cream tub top, a bucket cut apart and covered with fabric, a (thin) wreath, a tennis racket minus the string. There are many possibilities, just make sure that there are no sharp edges and if you will have an audience cover the hoop to make it attractive with pretty duct tape (it now comes in many colors) or fabric. I bought an 8" wooden embroidery hoop at a Thrift Shop for .10. Watch Garages Sales too. 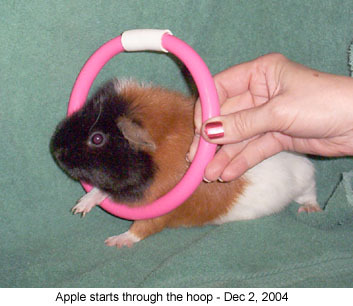 To teach "Jump Through the Hoop", hold the hoop in front of the cavy, who is calm and is in a safe place. You are holding the hoop so that it touches the ground or bottom of the cage. Call the cavy's name while holding a treat in your other hand on the far side of the hoop to entice your pet to step forward to receive the treat. Here is where you might need three hands . If the GP does not come forward, or if it moves away from the hoop, give the animal a cupped hand nudge, or easy push, through the hoop. Praise the GP for coming through the hoop. Use the word "good" as soon as the GP comes through the hoop, each time. Treat the animal, this is where clicker trainers would click the clicker. Now, repeat this step over and over until your Guinea Pig comes through the hoop on it's own and is happy doing it. Always give a verbal command to the Guinea Pig. I use "Through the Hoop". This is great basic training for agility jumps. After your GP is comfortable coming thru the hoop on it's own, lift the hoop up just a bit. Each time your GP has completed the task, treat, click or whatever you do to let the animal know it has done what it was asked to do and it has pleased you. Now, you can start raising the hoop off the ground just a little bit. Remember Guinea Pigs are only going to (or should) jump the hoop at about an inch, three at the most. I bought a Hoop to teach the Guinea Pigs to come through, and cover a bit for a Covered Hoop. I bought an embroidery hoop and paid more then I wanted to, but needed it.....and then the thought occurred...... PERFECT! It is about 10" diameter. What came to mind was that I could put the newspaper between the hoops rather then taping it on each and every time. After I tried it with the newspaper, it is PERFECT! I taught Matey to come through a COVERED HOOP with only about an inch at the bottom open, in about 10 minutes! And he is a RIOT when he comes through! First I held the carrot on the far side of the hoop, with Matey on the other side, and held a carrot for him to come and eat......he came right through (Captain and Damsel did not start this easily). So after Matey came three times through, I added a sheet of newspaper cut down so that it would cover about one third of the top of the hoop, he came right through. After having him come through a few times, I added to the newspaper, downward, so that more then 1/2 of the hoop was covered. He came right through. I had him come through a few times and added newspaper til there was about 3" uncovered at the bottom. I put the carrot through the crack and called him. He came right through. I should add that Matey is far and above the most confident GP I have ever seen. Much more confident then Captain and Damsel and he is not only from the same place, but related to them. I took the newspaper and covered the hoop all but about 1/2" at the bottom and set the carrot there for him to see. YES! He sure did come through the Covered Hoop! Please watch the video to see how nice the hoop looks and how Matey comes right through. You will need an item that it can easily pick up. I used a metal cat toy ball. A crocheted ball, a plastic cat toy ball, or something like those would work well. The ball must have space in it, like holes or bars, so that the GP is able to pick it up with it's teeth. Work your Guinea Pig on a table that has nothing else on it. A small table is best. Have the Guinea Pig facing you with the item to be picked up between you. Using a carrot or piece of celery guide the Guinea Pig to the item. Tell your GP to "pick it up", "take it", "fetch" or what ever cue word you chose. When the Guinea Pig touches the item with any part of it's face, or sniffs the ball, say "good!" and give it a bite of the treat. Move the GP back away from the item (good time to teach "back") and repeat this same step several times. After your GP start going to the item and touching the item with it's nose each time you say "pick it up", don't treat, just wait, the GP will then do something to let you know it is at the item to make sure you know. It will either put it's foot on the item, if it does tell it "No." Or the GP will, more likely, move the ball with it's mouth. As soon as it does this give a happy "goooood!" and give a treat. Repeat several times. Keep using this same item for a couple of sessions. Then start a session using this same item, but then switch out this item for another. Give the same "pick it up" command/cue word and try to stand in the same place and do everything as you had started with the first item you asked your GP to pick up. Do you have a child's toy piano or small, Guinea Pig sized Key Board? If not, check Garage Sales and Resale Shops (I have bought several for $0.25 - $5) This is an EASY trick to teach a dog, but will take more time training a Guinea Pig. First you would start by just holding your Guinea Pig and holding the key board in front of you and hit the keys lightly to get the Guinea Pig used to the sounds. With a sliver of carrot, hit a piano key and treat the Guinea Pig and do this over and the next several days a few time each day. Sit your Guinea Pig in front of you on the floor,. 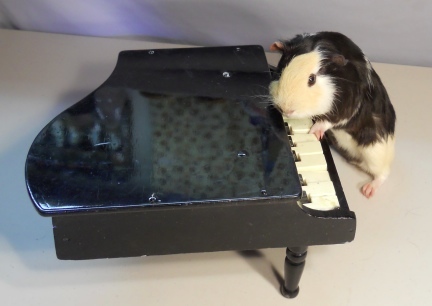 Give the cue "Play Piano" and hold a treat just out of reach over the key board so that the Guinea Pig much come forward, stepping on a key to receive the treat. Give verbal praise (click if you use them) and a treat as soon as the Guinea Pig hits a key. Repeat. Your Guinea Pig, like Pavlov's dog will catch on pretty quick that it is the sound it makes with it's foot on the keyboard to get the treat. It will learn the command "Play Piano". 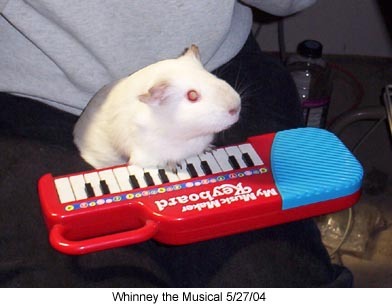 Once it has caught on, move your hand out of reach of the Guinea Pig, so that the Guinea Pig has to move one way or the other to make the sound, this way it will hit more then just the one key. It might take a bit of time to teach the Guinea Pig that it needs to hit more then one key to get the treat. If your Guinea Pig steps up on the keyboard while training, you have made it reach too far or it stepped over the keys. Gently push the Guinea Pig back WITH THE HAND THAT IS NOT HOLDING THE TREAT and gently say "No, Play Piano" and continue the training. This is an easy trick to teach. Set your Guinea Pig on the table in facing you. With a tasty treat tell the GP to "Circle" move the treat in a circle above the GP so that it follows it around. When the Circle is complete tell the GP "good" give the treat. Pet the GP and give verbal praise. Repeat a few times over a few times. After a few days set the GP in front of you and use your hand over the GP in a faster motion without the treat in it and tell the GP "Circle" and see if your GP will understand and turn a circle. If your GP does not take the verbal and hand cue, go back to using the treat and wait a couple of days before trying the hand alone cue again. This is when the GP does two or three circles rather than just turning around and "Circle" once. Train the same as the above trick only give the command "Spin" and have the GP follow your hand around twice IN THE OPPOSITE DIRECTION YOU TRAINED THE GP THE "CIRCLE" before treating. Guinea Pigs do not have the balance that most other small animals have. While this trick can be taught to your GP you need to know that it is a hard trick for many Guinea Pigs. Teach this trick slowly and treat the GP for any try that they attempt at first. If you have a GP that tips to the side, stop trying to teach this trick, there are so many other, safer, tricks it can learn. Set your Guinea Pig on the table facing you. Using a carrot stick or a piece of celery hold it just above their head, give the cue word "Stand" or "Sit Up" or whatever word you have chosen for this trick. When the GP is reaching up and stands on one front foot, say "gooood" give the GP at bite of the morsel. Repeat three times. Stop for this session. Later in the day, or the next day, repeat. After four times as was, wait for the other front foot to come off the table before saying "goooood" and giving a bit of the fresh veggie. As I said, this is a hard trick for some GPs. Repeat this about four times and stop. Each session start where you left off then ask for a little bit more, a little higher with the body in the air. Now some Guinea Pigs will come up on their hinds the first time. Reward verbally and with the veggie bite. Repeat once or twice more and stop. Balance is the key. Don't over due this trick. Ok, so that you know right up front, your GP is not going to move the dominoes around lining up the number of dots on the Dominoes. However, you can easily teach your pet to knock down a row of Dominoes for a treat. Start with one Domino standing on it's side. Hold a treat for the GP just on the far side of the Domino, when the GP's nose knocks down the one Domino, give the GP a treat and say the word "goooood!". Repeat a few times for three sections. Then after your GP is doing this well, add another Domino behind the first. Repeat with just the two Dominoes for a couple of sections, then add one more Domino. And of course you add on more Dominoes as the days pass. If your GP is spooked by the noise of the dominoes falling, hold your GP in your arms as you have someone else knock down or drop dominoes on the table so that your GP becomes used to the noise. Use a small box that does not have a lid about the same size as your Guinea Pigs food bowl. Set a treat in the box next to your GP's food dish when feeding. When they take the treat out of the box, say "gooooood" and remove the box. Repeat twice a day for a few days. In a few days, after your GP has caught on to retrieving the treat from the box, wrap the box, but not the top of the box, leave it open. Use colorful paper. Repeat the idea of leaving this with a treat in it for your GP. Most will not even notice the box has changed, or if it did notice it did not care. Now. Take a piece of newspaper, or tissue paper and wrap it around just the edges of the top of the box, leaving an opening for the GP to see the treat. Give a treat in this box, same as before, to the GP. Then next day make the opening a bit smaller, ie, rewrap the top of the box but extend the edges closer to the middle of the box. Give this to your GP as before. Then next day, make the middle smaller and so on. Finally, close the top with paper and watch your GP "open their gift." Start using the box only during training time, no longer beside the food bowl in their cage. Start using cue words each time you give the GP it's gift. Words like "open your gift". There are several ways to teach a gp to push a bowling ball towards a set of GP sized ten pins. It is a good idea to have an "alley" set up for your GP. An alley can be slanted a bit if you like, but does not need to be, and a flat surface is easier to work with. A flat surface will work just fine. On your little GP alley you might want to have side and back boards. That way your bowling pins will not fall everywhere. Set up your bowling pins as you would see them set up for humans in a bowling alley ready for the ball to come down the lane and knock them down. Now, as I said, there are several ways to teach this to your GP. Probably the easiest way is to set a treat next to the ball, or wipe a treat/peanut butter, on the bowling ball. Show the treat to the GP and give a command...you could use "push", "play", "bowl", "your turn", whatever one or two word cue you would like to give. Be sure to praise your GP when it touches the ball, even if the ball does not move. If the ball does not move, repeat the cue word and move the GP close to the ball. Your GP might want follow the ball down the alley, you need to train them to stay and let the ball go. Hold the GP back, if necessary as the ball rolls. I have had Pet Fancy Rats that will push the Bowling Ball with their nose. 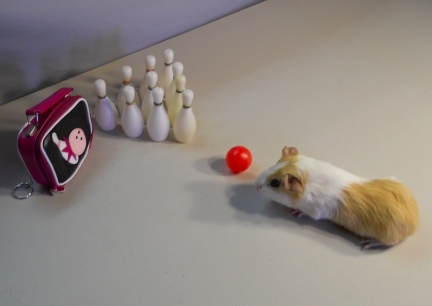 Matey, my Guinea Pig, is working on learning to bowl. I was starting to teach him to push the ball with his nose, when he, self taught, or accidentally, or something, kicked the ball with his front foot, it actually knocked down a pin. So that is now what we are working on. Shaping the trick so that he lines up and kicks the ball. I have set up an "alley" with 1" x 2" wood so that the ball stays "on the alley" rather then flying off the table. Now and again, he gets a good kick on that light weight plastic ball! I hope to video tape him doing this trick soon. I have seen this "trick" fixed so that the ball rolls down hill and is on a rutt, or carved alley, so that the animal reaches under the ball for a treat and the ball falls forward and knocks the pins down. Cute. Looks good to the unsuspecting spectator, but the trick is on them, not taught to the animals. But it might be another way to start the Bowling Training. To me, too much work to start training. And I want the pins to fall at will and the ball to go where it will so that the animal gets used to the action. Some Guinea Pigs learn to play Basket Ball real easily! If your Guinea Pig plays with items in it's mouth, if it moves items around it's cage, if it puts items into it's food bowl, you will have such an easy time teaching it to play Basket Ball. You will need a ball that it can easily pick up. I use a metal cat toy ball. A crocheted ball, a plastic cat toy ball, or something like those would work well. The ball must have space in it, like holes or bars, so that the GP is able to pick it up with it's teeth. You also need a Basket Ball net with backboard. (we sell sets in our on line store). You may also use a bowl or wicker basket for your net. Work your Guinea Pig on a table that has nothing else on it. A small table is best. Have the Guinea Pig facing you with the ball between you. Using a carrot or piece of celery guide the Guinea Pig to the ball. Tell your GP to "pick it up". When the Guinea Pig touches the ball with it's face, or sniffs the ball, say "good!" and give it a bite of the treat. Move the GP (guinea pig) back and repeat several times. After your GP start going to the ball and touching it with it's nose each time you say "pick it up", don't treat, just wait, the GP will then do something to let you know it is at the ball. It will either put it's foot on the ball. If it does tell it "No." or it will, more likely, move the ball with it's mouth. As soon as it does this give a happy "goooood!" and give a treat. Repeat several times. When you Guinea Pig is reliable on picking up the ball with it's mouth. Get your Basket Ball Net and move it under the ball as the GP picks the ball up in it's mouth. Give the cue "Basket Ball" or what ever word you choose. If the GP does not pick the ball up high enough, pick the ball up after the GP sets it down and place the ball in the net. After you have moved the ball into the net, say "gooood!" and treat the GP. After a couple of sessions of you putting the ball in the net (and I doubt you will have to. My two GPs caught on to the net VERY fast), but if after a couple of sessions if you are still putting the ball in the net, do not treat the GP until it places the ball into the net. You might be very surprised what your little GP will do. They are incredibly smart. PLEASE WATCH OUR VIDEO OF CAPTAIN LEARNING TO PUT THE BALL INTO THE NET. YOU WILL SEE ME MOVE THE NET AT FIRST SO THAT HE WILL UNDERSTAND/SEE WHAT I AM ASKING HIM TO DO. You will need an item that it can easily pick up. An item such as a wire cat ball, a crocheted ball, a plastic cat toy ball, or something like those would work well. The item must have space in it, like holes or bars, so that the GP is able to pick it up with it's teeth. Work your Guinea Pig on a table that has nothing else on it. A small table is best. Have the Guinea Pig facing you with the item to be picked up between the two of you. Using a carrot or piece of celery guide the Guinea Pig to the item. Tell your GP to "pick it up", "take it", "fetch" or what ever cue word you chose. When the Guinea Pig touches the item with any part of it's face, or sniffs the ball, say "good!" and give it a bite of the treat. Move the GP back away from the item (good time to teach "back", see below) and repeat this same step several times. After your GP starts going to the item and touching the item with it's nose each time you say "pick it up", don't treat, just wait, the GP will then do something to let you know it is at the item to make sure you know. It will either put it's foot on the item, if it does tell it "No." Or the GP will, more likely, move the ball with it's mouth. As soon as it does this give a happy "goooood!" and give a treat. Repeat several times. Keep using this same item for a couple of sessions. Then start a session using this same item, but then switch out this item for another. This is a good time to introduce your Tic Tac Toe Game Piece. Give the same "pick it up" command/cue word and try to stand in the same place and do everything as you had started with the first item you asked your GP to pick up. You will need an item like a small basket or a small bowl that your GP can place an item in. Using your item for your Guinea Pig to pick up, move the bowl or basket under the ball as the GP picks the ball up in it's mouth. Give the cue "Basket Ball", or "Put it here", "place" or whatever command/cue word you choose. Keep the bowl or basket low, tipping it toward the Guinea Pig if needed. If the GP does not pick the ball up high enough, pick the ball up after the GP sets it down and place the ball in the bowl. After you have moved the ball into the bowl, say "gooood!" and treat the GP. Seeing you place the ball in the bowl the GP will catch on to what you are asking it to do. Your GP wanting that treat as fast as it can get it will soon place the ball in the bowl quickly. Set up your table with nothing on it but the Tic Tac Toe Game Board and Game Pieces. I set a towel down first so that my Guinea Pigs do not slip or slide it's footing. You need to understand that your Guinea Pig is not playing Tic Tac Toe for money, so the rules are a bit different. You certainly can teach your GP to take turns with you putting the pieces on the board. But I doubt, I could be wrong, but I doubt, that your Guinea Pig, smart as they are, is going to use any strategy or even care if it gets three in a row. The idea of this game is to have fun training and playing with your Guinea Pig, it is also very fun to show off in front of your friends and families.....get video! This is a trick that you have not asked for. It is the trick your pet may preform to get the treat you are holding so that it does not have to do what is being asked, or it might do this trick just for a treat. It could be the pet does not yet understand what you are asking, so it "goes to" a trick that it knows well. "Go To Trick" is a trick that is easy for the pet to do. It is a trick you have taught it, probably early on in training. It will make you smile when the pet does this trick. IF YOU ARE ASKING FOR A PET TO DO A TRICK, DO NOT TREAT THE PET IF IT DOES NOT DO THE TRICK ASKED, BUT DOES THE "GO TO TRICK". Not only will you reward bad behavior, you will enforce that the pet does not have to do what you are asking, but can do an easier, or more known trick for the same treat. If you give a treat for the "Go To Trick" your further training will become harder and more frustrating for you. I hope to be adding more tricks and training ideas as this site grows. Please check back often. Remember! You alone are responsible for the care and training of your own animals. Every animal under your care depends on you. PLEASE do not let them down. Getting photos of your GP is so important. It might now seem so at the time. But small animals live such short lives, as compared to humans, and too soon they are gone forever. It is so nice to have those photos to look back at. Not to mention that you will have proof when you tell people that you have/had a GP that ran a little Agility Course or does/did tricks. Take the time to set up the camera. Change your clothing if you need to. Groom your GP and train in a clutter free area. Get Those Photos before the opportunity is gone for good. Teaching "No" is a natural progression when training an animal. As you continue to work with them they catch on to "no". Be sure you make yourself clear when training your animals. When you say "no", do not change your mind, do not give a treat to the animal, do not smile, do not move (unless you need to move the animal), do not laugh (OK, try really hard not to). Animals quickly catch on to our body laughing. Laughing = Happy. Just like the human child that gets a laugh for bad behavior, they and animals too, will repeat that bad behavior because you showed it made you happy. When you tell your GP "no" make it mean "do not do that" if you need to move the GP away from what it is doing. "Wait" can also be "Stay" and yes, not only can GPs learn this, mine know it. It will not only come in handy to keep your GPs safe, but when you are setting up trick props they need to know to stay back and leave it alone until told. It will also keep them safe, if working on a table, when you are setting up and not looking directly at them; so that they do not fall off the table. The way I taught (I use wait) it to put my hand between them and where they might want to go saying the word "wait". If they move, I set them right back where they were when I told them to "wait". I was amazed how quickly they caught on to this command. Another one of those commands that might save your GPs life, but will at least help when you are working with them and they keep coming forward toward you. I taught this by telling them "Back Up" then picking them up and setting them where they were. Then I started using the back of my hand and GENTLY and slowly pushing them backwards. Soon, all I had to do was move my hand toward them and give the command "Back Up". Remember, this is not a hurtful, back handed shove. When working with animals use a gentle, guiding, easy hand. But always make sure you follow through.